More than a decade after leaving his native country, Albanian folk dancer Bashkim Braho realizes the importance of preserving his art form: "The major exodus of a majority of Albania's artists in the last decade has resulted in a serious gap in native artistic ability and leadership. The artists who have remained in Albania have become isolated and have little opportunity to teach and perform their traditions. Therefore future generations are losing critical opportunities to grasp their cultural identity. These conditions have resulted in the serious endangerment of the Albanian folk traditions". 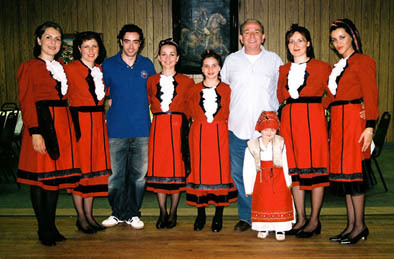 Albania has a long history of a variety of folk music, dance, and costumes, many of which are unique to particular regions of this small country. Although he has studied and taught many different dance styles from various regions, Braho's specialty is folk dance from the Cham population. A minority group whose traditions are endangered in current Albanian society, the Cham live in a region that was considered part of Albania prior to 1913. It was here in Chameria where elders taught Braho's father the traditional dances, commonly known as "valle", that have been practiced for more than 200 years. Just as he learned these traditions from his own father, Braho continues to pass Albanian folk dance down to his son, Donald. With the help of an MCC Traditional Arts Apprenticeship grant in 2006, Bashkim and Braho have worked together on Osman Taka valle, in which Donald mastered the part of the lead dancer. This dance tells the striking and inspiring story of a warrior sentenced to death by an Ottoman Sultan. When asked by the Sultan if he had a last wish, the warrior was granted his request to dance this valle. The Sultan was so impressed by the passion and physical agility the warrior demonstrated that he spared the warrior's life. The dance was named after the warrior, Osman Taka. As lead dancer, Donald performs skillfully executed steps, leading a line of men. He then drops to his knees and arches his back, extending his chest upward to form a bridge. The other dancers then step forward and dance on his stomach, which symbolizes the strength and centrality of the lead dancer.